not just about designing different teaching methods. But rather we need to provide creative and innovative learning experiences for our students. Change is happening so fast that we need to teach students how to think and how to learn. Students should also be taught how to be creative and innovative individuals. In meeting the challenge of preparing students for the future roles in the society, UTM is faced with the task of rethinking curriculum, delivery medium and assessment methods. The design and development of effective educational materials should therefore be undertaken by lecturers who are familiar with their students and classroom environment. One useful approach to deliver the content is the use of case-based examples. This approach should be incorporated in the teaching and learning activities and take into account cases in local settings. The next generation learners are highly accustomed to new and evolving technologies. Therefore, lecturers also need to equip themselves with new and state-of-the-art technologies for teaching and learning. 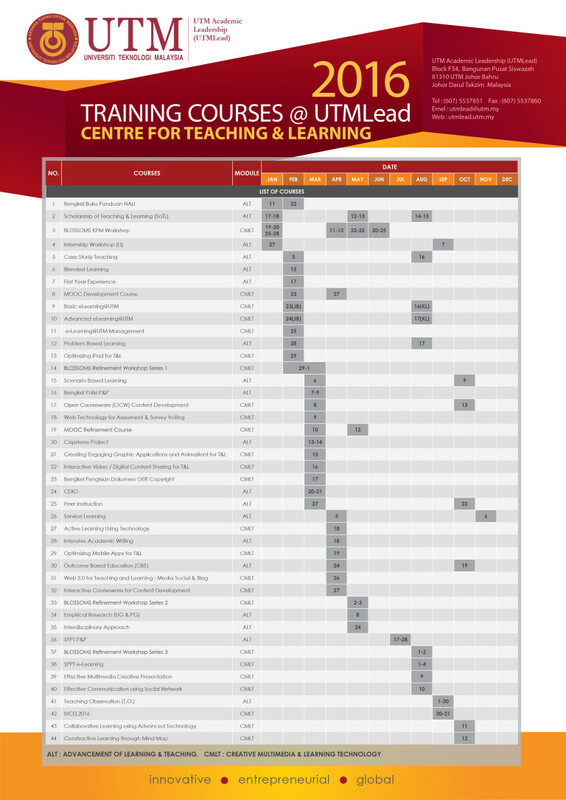 The Centre for Teaching and Learning (CTL), UTMLead is dedicated to provide the teaching staff of Universiti Teknologi Malaysia with guidance, resources and support needed to ensure that the highest quality of teaching and learning takes place throughout the University. Through individual, group, and campus-wide structured and non-structured programs, CTL keeps the teaching staff abreast of pedagogical developments in and outside the classroom, maintains and provides useful resources on teaching and learning and supports teaching staff in enhancing their teaching. CTL also provides training and learning support programmes to students to promote academic excellence and to facilitate the development of generic skills to assist the University in producing competent, creative and versatile professionals. Providing academic staffs with technical training, enabling them to enhance their knowledge and skills in T&L interactive digital design and development especially for e-learning and stand-alone learning purposes in their respective fields. Creating digital interactive teaching materials out of materials designed by academic staffs. Facilitates the improvement of developed interactive digital T&L materials in terms of quality and suitability. Providing technical expertise and consultation in teaching design to academic staff who are interested in developing interactive digital T&L materials on their own. Providing interactive digital based help-desk assistance for academic staff that need it. Carry out research that may enhance the quality and effectiveness T&L by optimizing the usage of latest technology. Assessment and CQI of T&L. Strategic and operational T&L initiatives in tandem with the requirements and setting of New Academia. SOTL – oriented research and publication. Consultation and services in pedagogy and andragogy related areas. CTL has a large collection of research publications, books, videos and other resources relating to university teaching and learning, flexible learning, assessment, higher education and etc. These resources and publications are available for use by UTM academic staff. To use the collection, visit us at our offices on Level 1, Graduate Studies Building (F54), UTM. Some resources are also available online or can be ordered from CTL. Quality assurance and evaluation of teaching and learning. Design and development of digital animations and other digital learning object. Professional development for teaching staff on matters related to the enhancement of teaching and learning. The use of information technology in teaching. Research on teaching and learning and the dissemination of information on teaching and learning. Design and development of course websites and multimedia applications.